Hibiscus has been actively working towards 14001 Certification for over a year. Quality and responsibility are at the core of Hibiscus Plc’s values and gaining certification for two key management system standards: ISO9001 for quality and ISO14001 for the environment, helps us to deliver on this. Hibiscus Plc is a relatively small label-printing and software company and everyone is under constant production pressure. However, our employees, customers and the general public increasingly recognise the importance of minimising the negative impact that business activities can have on the environment. Energy use and waste generation are major considerations in the print industry and there is always more that can be done to reduce energy use, recycle waste and eliminate pollution. Hibiscus Plc is proud to be making our contribution to this continual improvement process. Certification to ISO 14001 has given Hibiscus Plc a sturdy environmental management framework, enabling us to identify the different ways in which we impact the environment and act in accordance with the environmental legislation that regulates it. We believe certification will provide a number of key benefits including a reduced cost of waste management and savings in consumption of energy. The 14001 standard is of growing importance because an increasing number of organisations will only work with suppliers that have certified environmental systems in place. Moreover, our employees and customers can see that we have taken genuine steps to ensure that our environmental impact is being measured and reduced. The ISO 14001 certificate is based on three areas: compliance with legislation & regulations; management of environmental risks; and ongoing improvement of environmental performance. This can cover such areas as emissions, waste, and the use of raw materials and energy. In order to achieve certification Hibiscus had to demonstrate that it has an environmental management system in place to reduce waste and energy use, improve efficiency and meet all legal and regulatory environmental requirements. Investment in key areas of our production processes including the studio and screen-washing departments have made valuable contributions. The standard offers a systematic approach to environmental management and has helped us to get a firmer grasp of our energy and materials consumption through improved usage measurement and analysis. Having established these, we were able to put operating controls in place, addressing wasteful practices and improving efficiency. Hibiscus has a strong culture of doing things properly and everyone throughout the company has played their part, from senior management to the print-shop floor. Everyone at Hibiscus was totally committed to gaining ISO14001 and the journey to certification only took about twelve months. 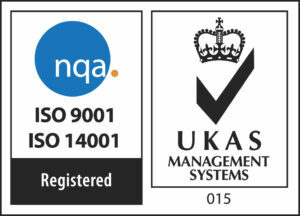 Hibiscus already had many similar system requirements in place from our earlier quality certification for ISO 9001: a globally recognised official quality management system standard. Hibiscus Plc is honoured to have been recognised for our efforts in managing and reducing our environmental impact and we will continue to strive towards improvement – not only for the positive impact it has on our own organisation, but for the genuinely positive contributions we can make towards the environment. Achieving certification demonstrates Hibiscus’s commitment to being a more sustainable organization and the 14001 award is consistent with our corporate values and philosophy. This award is the recognition of a lot of hard work and a validation that Hibiscus is truly a market leader in developing high quality, performance driven, environmentally-responsible products and solutions. We will continue to hold ourselves to the highest possible standards and persue relationships with companies and organizations who share the same ideals.